Make your home lighter and brighter without spending as much on your electricity bills with skylights from Sunshine Skylights. Highlight the beauty of your home and cut on your utility costs with our different styles of traditional and custom skylights that will fit your taste and budget. Lighting your home up has never been this easy and you will be glad you are making your place the bastion of green energy. 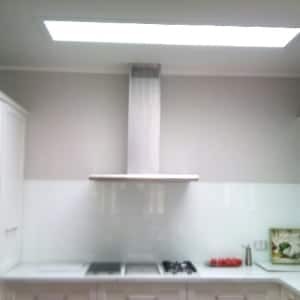 We at Sunshine Skylights keep elevating the quality of our product line, making sure that we can help you with your ever-changing sky lighting demands with more efficient and high-performance skylights made for Australians by Australians. Energy costs are becoming a growing concern in many households, not to mention climate change. Our skylights are designed to drive down your energy cost by filtering as much of that good sunlight as possible into your home through daylighting solutions. What daylighting does is add as much of the beneficial white light from the sun and prevent you from using electrical lighting, giving you as much as 10 percent cut in energy use in residences and as much as 80 percent in some buildings according to government energy studies. That’s a lot of potential savings right there. What could you do with those savings? The increase in natural white light gives significant health benefits for you and your family, and if used in a business, on co-workers. This natural light of the sun helps regulate your body’s Serotonin production. Serotonin is known to improve mood, reduce mood swings, reduce unhappiness and keep you energized and moving. These a great benefits in the home or place of work. 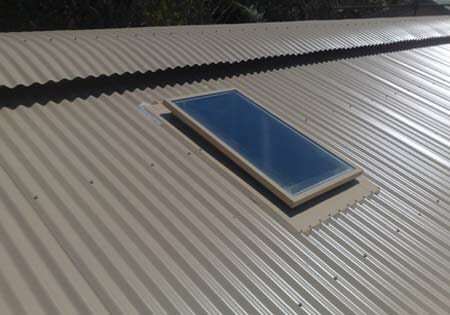 Sunshine Skylights is a proudly Queensland-based company and we know that the weather from our side of the country has been shifting between inclement to unpleasantly hot. We understand your need for that strong sun to shine on you so our traditional skylights are made to utilize as much sunlight as we can while making sure our installations can withstand rains, heat and hail. We proudly make sure that each product in our line is built to last. As we have manufactured skylights since 1987, our products are made from the finest materials. Our highly durable next generation zincalume steel is sourced from Bluescope – one of the industry leaders in steel technology across the entire country. Even the specialised superior quality paint that Sunshine Skylights uses comes from Taubmans – the most trusted Australian paint company that has been painting homes since the early 1900’s. Making your home brighter should not be intrusive. While we at Sunshine Skylights continuously make sure that our products can answer all of your demands for indoor lighting, we also understand your need to make sure your home is beautiful while being a bastion of green alternative solutions. 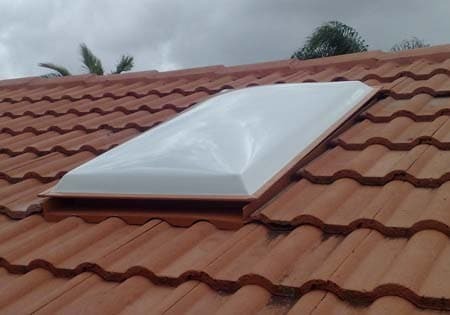 Our skylights are triple glazed to protect you from the fierce Queensland heat and the bottom glazing being waterproof keeps you dry in case of a bad hail storm. Our skylights will fit whatever style your roof may have. From clay to concrete tile roofs to metal and slate, to specialised roofing like Klip-Lok, Custom Orb, Trimdeck and Super Deck, our installations will be discreet and unobtrusive. This will keep your homes looking as classy as they will ever be while the installation is working. You will never even think that the skylights are there! 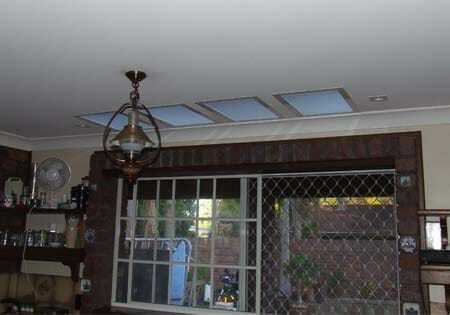 Each of our highly customised skylights are made to keep your house almost the same as it is. This means Sunshine Skylight’s professional team of installation experts will keep the surrounding ceilings as much as they originally looked like. Available in powder coated gloss white or clear anodized silver, each skylight will only be around 1.4 to 2 mm from the ceiling. For the older colonial style homes, we utilise timber frames that can be painted or stained wisely. Our skylights will brighten up your days and make the sun work for you! Well-lit homes look better, wider, more spacious and relaxing to live in than houses with big pockets of darkness. We would not want that for you! 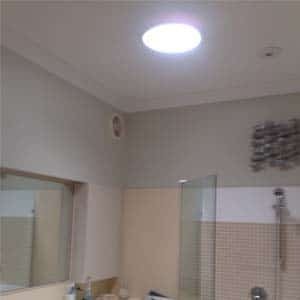 We also make sure that you get all the light without the harm from the sun’s rays. All of our skylights are glazed to keep harmful ultraviolet rays away from you and your family. This unique glazing system is made with an opal high impact acrylic dome, followed by two layers of clear polycarbonate. 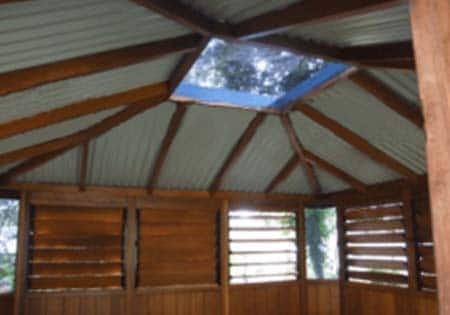 It keeps as much as 60% of the heat away while soaking up as much light as possible and being sturdy enough to keep hail from breaking all the way through. In addition to the glazing system, we add two additional UV filters to cut out the ultraviolet even further. All of this ultraviolet protection we give in each model is for your health and the longevity of your home. You also have a wide array of design options to choose from, depending on what you think suits your needs and the aesthetics of your house. The most traditional design are square and rectangular skylights and can be manufactured and customized up to the last millimetre! Sunshine Skylights can make something as small as 300 square millimetres up to 1200 square millimetres. We also have rectangular 500 mm x 1500 mm models that are good for those centrepiece ceiling areas in living rooms and design rooms. We help you choose what fits your home or business best. 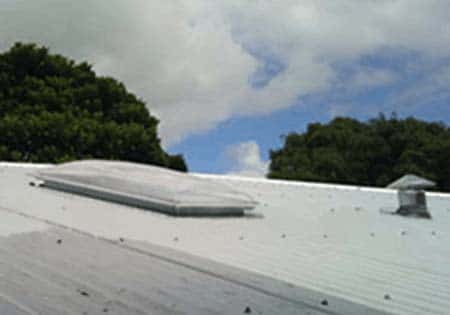 As a proud Queensland business, we at Sunshine Skylights value your comfort both physically and financially While our installations cut back on the money you would have spent on electrical lighting, we also make sure that our prices are very competitive so you can afford a cleaner, greener home. While all our materials are top quality and would last for a long time, we additionally back this up with a 10-year warranty so you can be sure you will get the most out of every purchase. 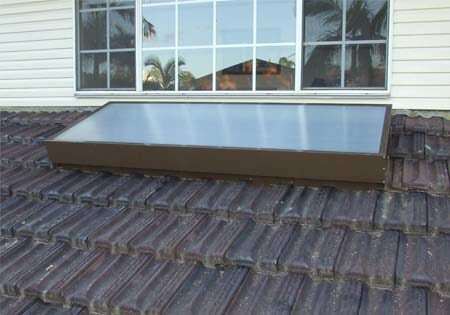 We are confident that our skylights are built to last and you will stop the loss of money coming from all your continuous, expensive utility bills. Green does not have to be expensive. What Sunshine Skylights offers you are skylights that go beyond just pushing in natural daylight into your home. What our product gives is a chance at a good, healthy life that is not run down by rising energy costs and dark patches in the home. Daylighting is good for you, your family and your home. A brighter, better home is just a call away. Get out of the dark and into the light and see your life change for the better. You don’t have to suffer anymore from the costs of using your lights all day and all night. A green sustainable better lite, happier lifestyle is within your grasp and Sunshine Skylights is there to be your best skylighting partner through it all. Solid Mirror shaft, for improved light. Triple glazed, giving you unmatched protection from Heat, Hail & UV Rays. Colour matched to roof Colour. Flashings designed to match roof type and material, not just a piece of aluminum roughly formed to the shape. Choice of White PVC ceiling surround or timber ceiling surround. Choice of Prismatic, Opal, Seadrift, Glass or Leadlight diffusers. All sizes available as passive or mechanically vented. Available as a do-it-yourself kit with full easy to follow instructions. 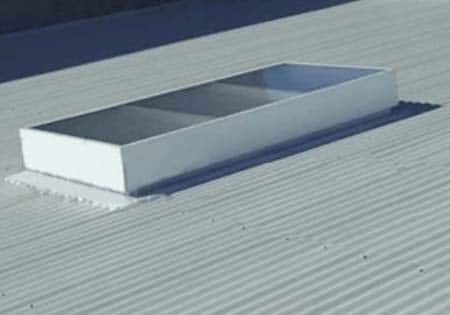 ‘A’ type skylights are typically used on the northern & western sides of the roof for optimum efficiency. 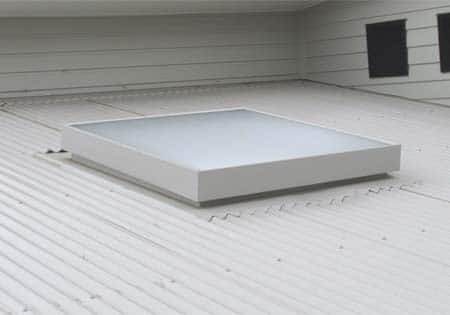 ‘ B’ type skylights are typically used on the Southern side of the roof for optimum efficiency, especially when the sun is lower in the winter months. High Impact Acrylic domes or Polycarbonate twin wall sheeting. Single, double, triple, quad, five and six layered glazing, giving you unmatched protection from Heat, Hail & UV Rays. Choice of powder coated white aluminum, clear anodized aluminum or timber ceiling surround. 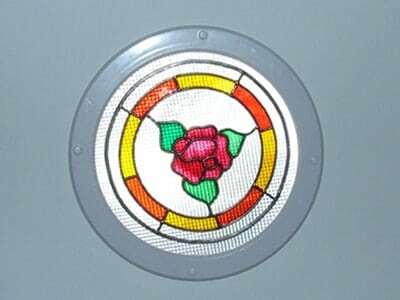 We can manufacture hatches with or without light panels. Any size for any type of roof. 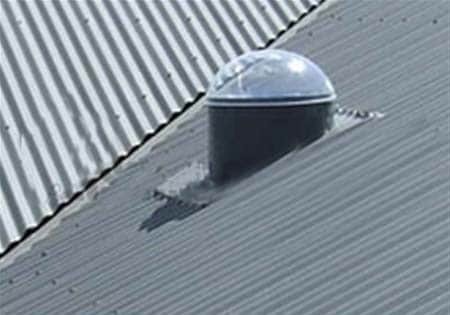 Our 300mm and 400mm round skylights are available in a mechanically vented unit, which includes a fully integrated 150mm continuously rated exhaust fan. All of our square and rectangular skylights are available in a mechanically vented unit, which includes a fully integrated 150mm continuously rated exhaust fan. Because these fans are mounted in-line you don’t see them, and they are a lot quitter. There is also no grille to get covered in grime; just a thin opening that is easily wiped clean. They have the capacity to move 75 l/sec in comparison to a standard ceiling mounted fan, which only moves 40 l/sec. 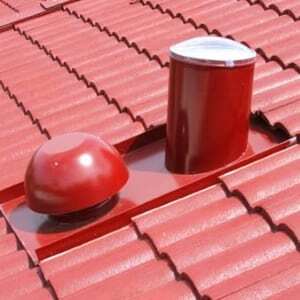 They are ducted outside the ceiling cavity so will not add moisture (bathroom) or oil (kitchen) into your roof space. 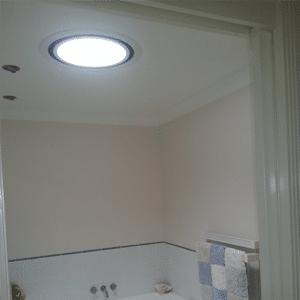 The main advantage of this system is fewer fittings on the ceiling; in small bathrooms the ceiling can get rather busy by the time you include a skylight, exhaust fan and normal light fitting. By using an integrated fan system and also adding a light fitting into the skylight shaft you only need one ceiling fitting! 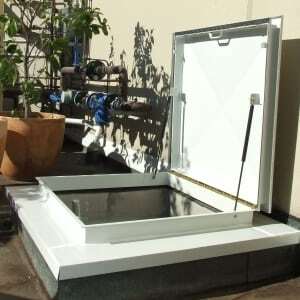 All of our skylights are available in a passive vented unit. These are good for bathrooms and toilets where mechanical ventilation may not be required. This picture shows a 1000mm x 1200mm skylight on a Custom Orb roof. It features a 6-layered top to protect against heat and hail. This picture shows what the inside of the skylight to the left looks like with a white 68×11 pine frame. 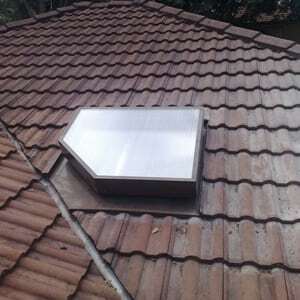 This picture shows a 1000mm x 1500mm skylight on a tile roof. It features a 6 layered top to protect against heat and hail. They are made from 42×11 colonial pine and painted white to match the ceiling. 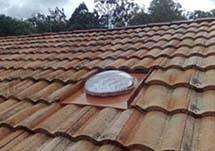 This picture shows a 1700mm x 500mm skylight on a terracotta tile roof. It features a 4 layered top to protect against heat and hail. The four ceiling surrounds are made from powder-coated aluminum ‘T’-bar. This 900×900 skylight is manufactured to suit the requirements of the gazebo builder; it has a charcoal dome with trims to match the roof colour. This is the result of existing roof sheets been changed to polycarbonate roof sheets on a mechanics workshop to let light into the storage area. 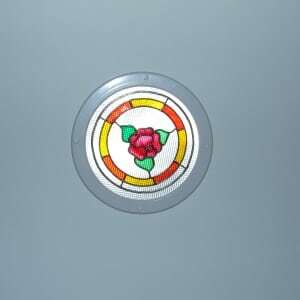 As an alternative to the traditional diffuser, you can choose to have a stained glass diffuser made. These are made using toughened glass for your protection. They are available in a range of designs as shown below, or you can choose your own to suit your decor. Because we multiple glaze we are able to reduce the radiant heat produced by the sun. 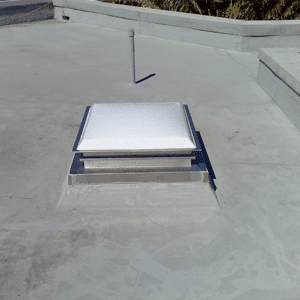 Vented skylights generally only have one or at most two barriers between you and the sun. This makes them the hottest! The more barriers between you and the sun, the less heat into the room. Our triple glazed skylights have four barriers between the room and the sun, three barriers in the skylight top and one barrier (prismatic diffuser) on the ceiling. Our square and rectangular skylights have 2,4 or 6 protective barriers in the skylight and one in the ceiling (prismatic diffuser). Are Your Skylights Too Hot? At Sunshine Skylights we specialize in protection against heat and hail. 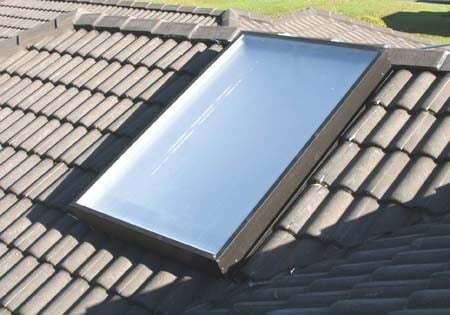 Using our conversion system we are able to significantly reduce the heat from your existing skylight without any great loss of light. In some cases we may be able to increase the amount of light and reduce the heat. Our multiple glazing systems will give you light without the heat so upgrade now and be ready for summer. For bedrooms and media room’s shutters are available to ‘turn off’ the daylight. They come with the choice of cord or electric control. 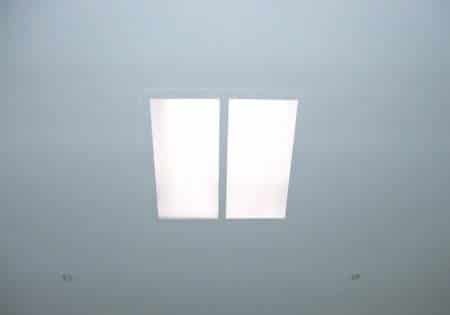 In some areas it isn’t practical to have a light fitting as well as a skylight, so we have a light fitting that is mounted inside the skylight shaft, these are suitable for both round and square/rectangular skylights. Due to the efficiency of our mirror shafts, our round skylights generally only need to be a quarter of the size of a square skylight. However, if you like the square look we are able to go from round to square and still use our mirror technology. 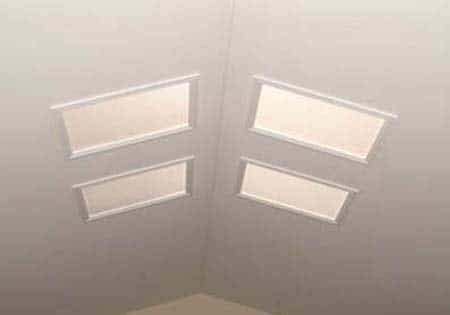 Square ceiling surrounds are manufactured from various styles of timber or white powder coated aluminum with a prismatic diffuser. We can supply roof ventilators in plain aluminum or all colourbond colors to suit all roofs. We can design and manufacture flashings for almost any roof penetration.